After a few hours, they are able to open their eyes, lift up their head and beg for food. The first weeks are very dangerous for a chick, as it can not regulate its body temperature, and therefor completely depends on their parents. They have to warm them close to their body, till the chick is old enough to keep warm from its own. According to which species, they get a thicker down after some weeks. But still rain, snow and wind can be dangerous as their down isn't weatherproof and they can get cooled off very soon. Next they walk around and move into crèches. They grow very fast and are regular, day and night, fed with small portions. A chick of only 1 kg can take more than half of his body-mass on food. 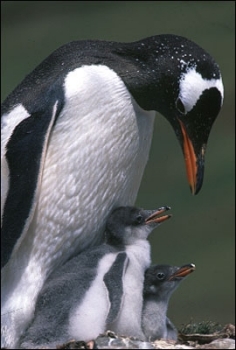 All penguin chicks get partly digested food, regurgitated by their parents. Among those species who have more than one chick, there is always a fight between the two. As long as they are small, the adults only have to lift up their head to avoid this. But when the chicks grow older, they chase the parent and beg for food by hitting them with their bills. To avoid such fight, the adult bird runs away and a wild pursuit starts. At the start the stronger chick has an advantage, arrives first and gets food. But then the second chick comes closer and the pursuit starts again. Now the second one, with an empty stomach, is faster and gets a bit of food. So in turns they both become food. Many birds limit the number of eggs. Among the crested penguins, this happens in a very strange way. With an interval of 6 days they lay two eggs. The first led egg is smaller(half as big) than the second one. Most of the time only the second egg hatch. When unexpectedly (e.g. 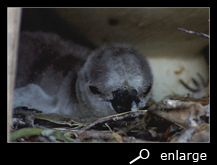 Fiordland penguin) both eggs hatch, still only one chick will fully grow up. Why it is so, is still unknown. Of all species, an adélie chick grows fast. They are fully grown after about 50 days. At the hour of hatching, it only weights 110 gr. 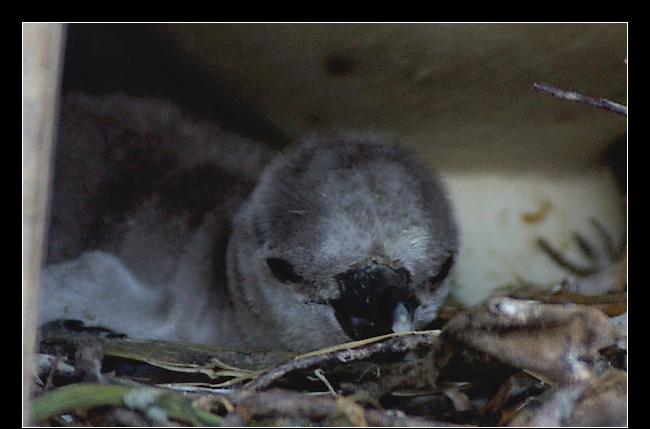 and they leave the nest with a weight of 3,5 kg. Most of the other species have a "raising space" of 55 till 100 days. King penguins are an exception on that rule. They need 13 months to raise a chick. They start (one year) breeding in November(early summer) and when the chick hatch in January, after 54 days, it will be well fed till April. But growing up takes more than one summer period. Therefore it takes more and more time to search for food. During the Southern winter period (between May and September) the chicks stand close together in a crèche, waiting for food. Most of them only are fed once till maximum three times during that period. Only the strongest will survive. After the winter period, they get more often food, so they can leave the nest after a few weeks. Therefore king penguins have only two eggs in three years. So next breeding season they will lay one egg late summer. Because this chick will fledge very late, the next season they have to skip breeding. The fourth season it starts over again. 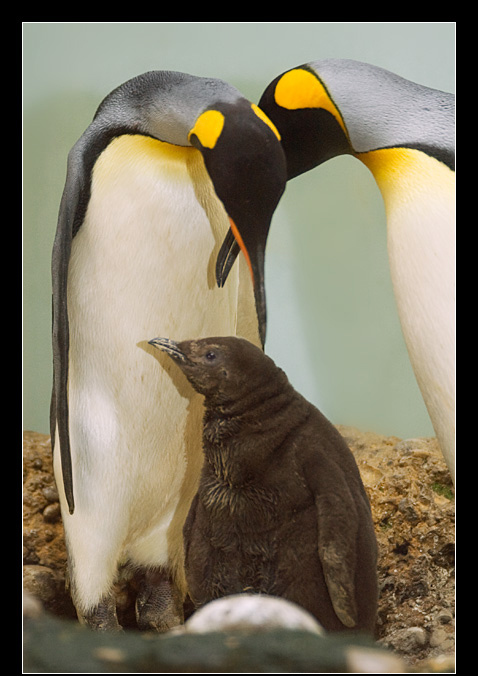 In such king penguin colony you will find all phases of breeding: juveniles and almost grown ups beside eggs and just born chicks. For an emperor penguin the breeding period itself even takes longer: they need 64 days before the chick hatch and growing up takes 150 days. Therefore emperor penguins start breeding during the winter period. In that way the chicks come out during summer, when there is a lot of food and the distance to the sea is the smallest. Once the chicks are big enough, they (except those of the crested penguins) come in a kind of "crèche". There they wait together till one of the adults return from sea to feed them. In such "crèche" it is safer and warmer.